A new study by eMarketer, released this week, finds that adults in the U.S. are spending more time on their mobile devices than on desktop and laptop computers. The same study estimates that mobile ad spending has more than doubled in 2013, while desktop ad spending has grown only 1.7%. 1. Visit your website with a smartphone. 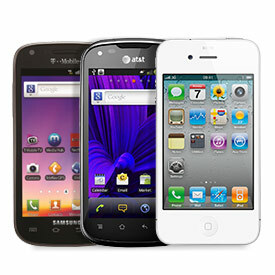 If you don’t have a smartphone handy, visit http://www.mobilephoneemulator.com/ to simulate the experience of using your site on a smartphone. If your site was redesigned more than a couple years ago, chances are good that it’s not going to look good, or that it will require the user to zoom to view it (certainly a less-than-ideal user experience). 2. Read this study from IDC, which found that 79% of 18 to 44-year-olds have their phones on them or near them for all but 2 hours of their waking day. Furthermore, the same percentage (79%) say that the first thing they do when they wake up each day is to check their smartphone. Among 18-24 year-olds only, the percentage that reach for their phone before they do anything else is 89%. 3. Read this article which compares mobile ad click-through rates with desktop ads. Or, if you don’t have time to read it right now, let me give you the executive summary: mobile ads have much higher click-through rates than desktop ads. The trend towards mobile computing is clear, and now’s the time to do the work necessary to take advantage of it! p.s. A new session of my online class, Creating Mobile Apps with HTML5 just started! Visit our site to sign up or to view the first lesson! This entry was posted in Editorial and tagged Advertising, html5, Mobile on December 19, 2013 by Chris Minnick.